(Waldorf, Md., July 4, 2018) – The Southern Maryland Blue Crabs announced Wednesday that right-handed pitcher Brandon Cumpton has had his contract purchased by the Toronto Blue Jays organization. 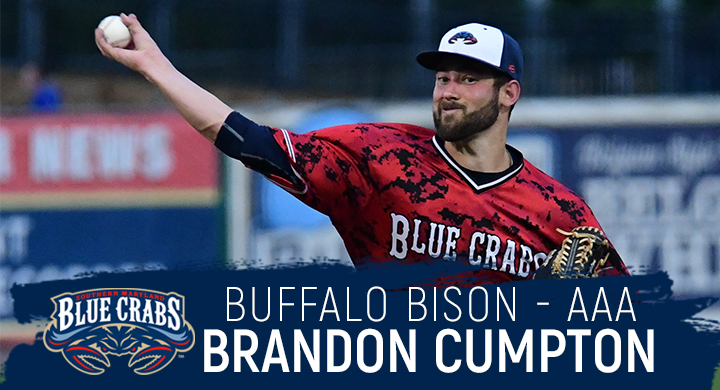 Cumpton will report to the Triple-A Affiliate Buffalo Bison, and is slated to start tomorrow for the team. The Georgia Tech alumni joined the Blue Crabs this season for his first in the Atlantic League this season. Cumpton was given a spot in the starting rotation, opening the year as the third starter for the team. The right-hander struggled a bit early in the season, but turned everything around in the month of June. In five starts last month, Cumpton went 2-1 with a 1.09 ERA, including three appearances in which he did not allow a run. His success on the mound was a key part of the Blue Crabs pitching staff posting a 15-14 record with a 3.65 ERA on the month of June. Cumpton was originally a ninth round draft pick of the Pittsburgh Pirates in the 2010 MLB Draft out of Georgia Tech. He posted back-to-back All-Star campaigns in the Pirates organization, being named a Mid-Season All-Star in 2011 and 2012 while at A and AA. Cumpton made his MLB debut the following season at just 24 years old, going 2-1 with a 2.05 ERA for the Pirates that season. Between two seasons at the major league level, Cumpton made 22 appearances and posted a 5-5 record.